What Follows Home Remodeling? Outdoor Remodeling! The American Society of Landscape Architects conducted a survey in 2013 of what are the top alfresco living trends, and found that homeowners are increasingly drawn to adding outdoor rooms for entertainment and recreation. Having an outdoor kitchen and living space for entertainment was rated to be popular by 94.5% of the respondents. Must haves garnishing over 95% of the vote include: grills, seating & dining areas, good lighting and fire pits or fireplace. 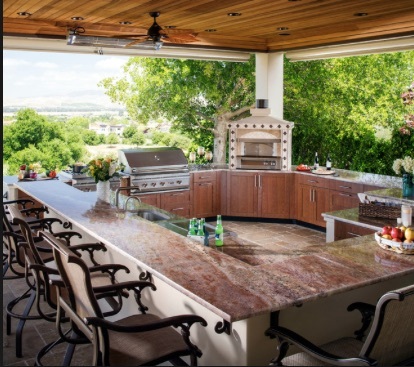 What are some considerations for planning your outdoor kitchen remodel? 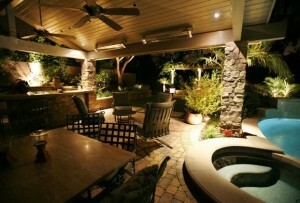 Cooking style: Consider all the ways you would like to prepare main and side dishes for your outdoor kitchen remodel. Besides a built-in grill, do your want a circular griddle for outdoor breakfasts or for Teppanyaki style Japanese cooking with drama and flair? A pizza oven for fun creations? Would you want side burners and warming drawer or two? 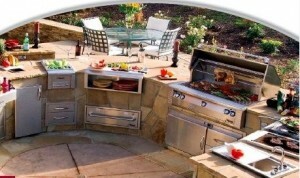 Cooking and Serving with ease: How many of the conveniences do you want to include for your outdoor kitchen remodel? How big of a sink? Do you want a refrigerator handy? A dishwasher nearby? What will you want to be storing in stainless steel storage cabinets and drawers? Make sure to include an open shelf for plates that are easily accessible for chef and guest alike. Don’t forget to include a generous cabinet with a roll out for trash and recycling. Comfort: Create an outdoor living space of cushy chairs, couches, and chaise lounges with a fire pit for a focal point. For dining, you’ll want a comfortable table and chairs. Consider ceiling fans to help keep cool in the summer and in floor heating to keep diners warm as they enjoy their food as the evening cools. The wow: Add some outdoor curtains that flutter with the breeze for intimacy and ambiance–they can even make the space seem so regal. And outdoor rope lighting, string bulb lighting, and pendant lighting that says, fun! Do you want a water feature? 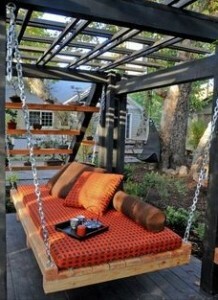 A swinging love seat? Make a list of wants and needs, figure out your budget, and call a remodeling design professional and enjoy a new extension of your home!